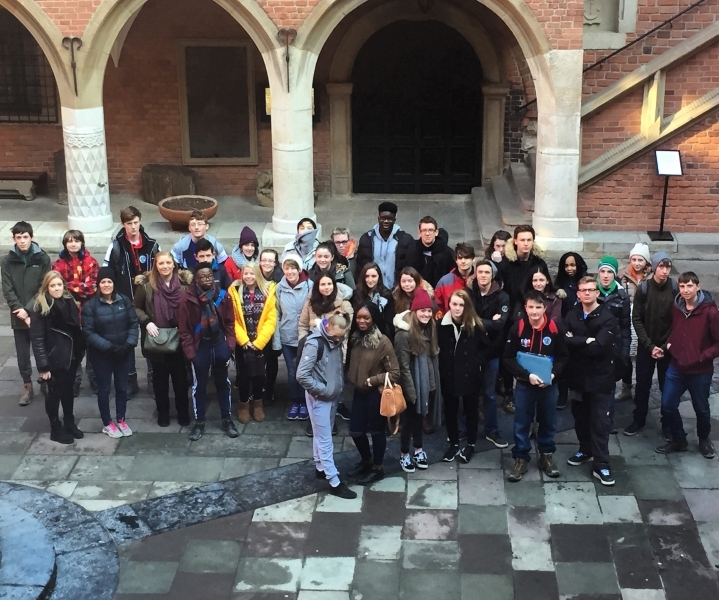 On the Friday 17 February, we set off from school with 33 fellow students on a history trip to Poland. We were brought by Mr. Mc Keown, along with Ms. Jenkinson, Ms. Delaney, Ms. Ní Mhurcu and Mr. Shields. 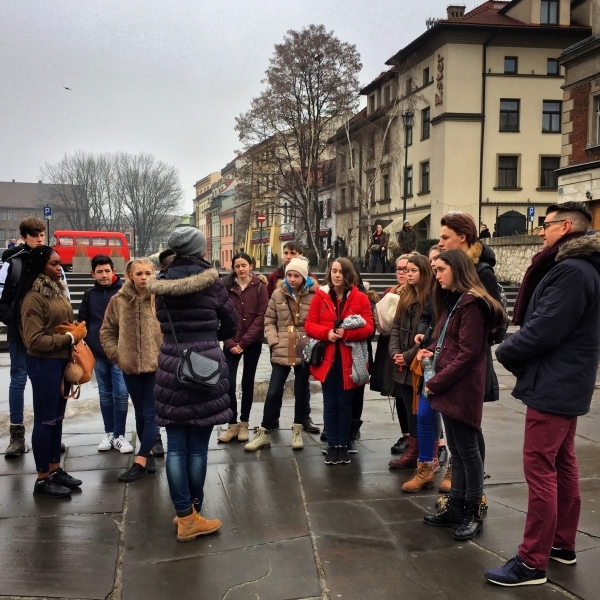 The trip included visits to Auschwitz concentration camp, the Schindler museum in Krakow along with a number of historical tours through different parts of the city. On our last day, we left Krakow to see the Salt Mines on the edge of the city. Both excited and nervous at the same time, I was not sure what to expect over the next few days. So with my luggage in tow, along with the traumatising memory of some very cringe worthy puns from the pilot, I stepped off the plane in Krakow airport ready for a fascinating and eventful trip. I most certainly was not disappointed. On our arrival on Friday, we stopped off at a McDonald’s before we reached the Hotel Alexander, which would be our main headquarters for the weekend. 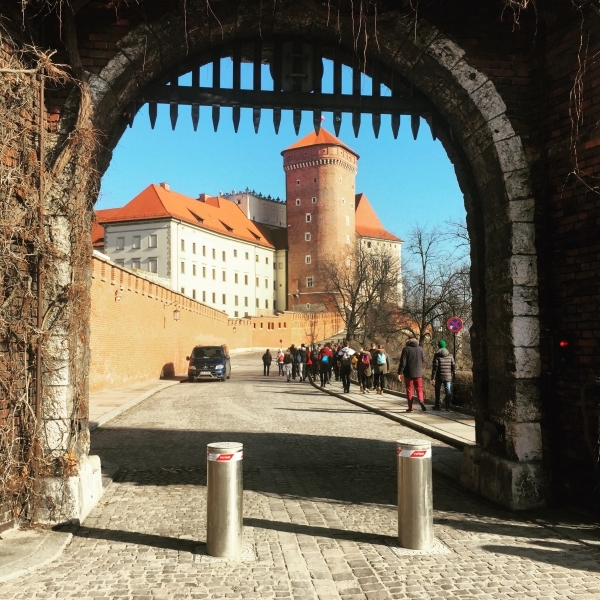 We had a bright and early start on Saturday at 6am (AKA ungodly hour of the morning), before we were given a tour and a brief history of the Jewish district of Krakow, known as Kazimierz, as well as the Jewish ghetto in Krakow during the Second World War. This was an area in Krakow which Jewish people from all around the area were forced into and trapped, before being sent to the Belzec death camp and the infamous Auschwitz-Birkenau concentration camp by the Nazis. Following this, we received a talk from holocaust survivor Monika Goldwasser, who gave us an incredibly emotional and harrowing speech about her experience of the holocaust, which will forever stick in my mind. 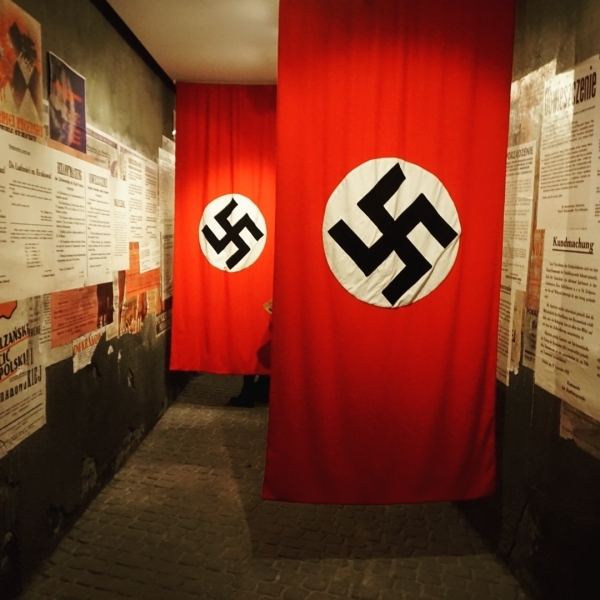 We were then given a tour of the Schindler Factory, now a modern day museum of the Second World War and Nazi occupation of Krakow, which was an incredibly interesting tour. Following this, we returned to the hotel for the evening. 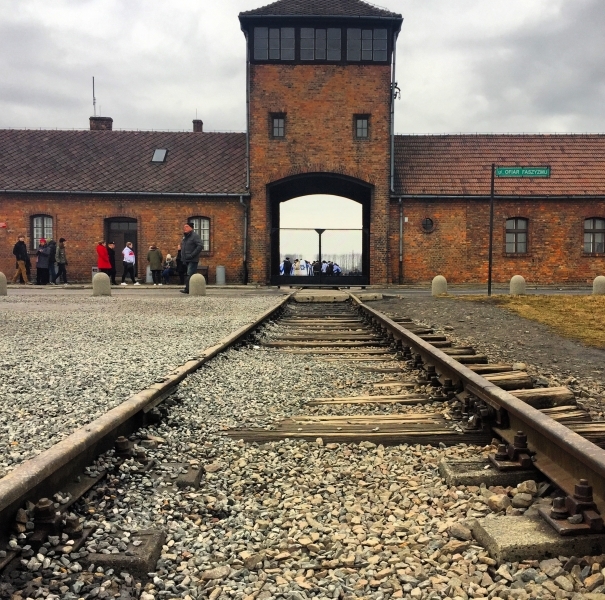 On Sunday, we travelled to the infamous Nazi concentration camp known as Auschwitz-Birkenau. 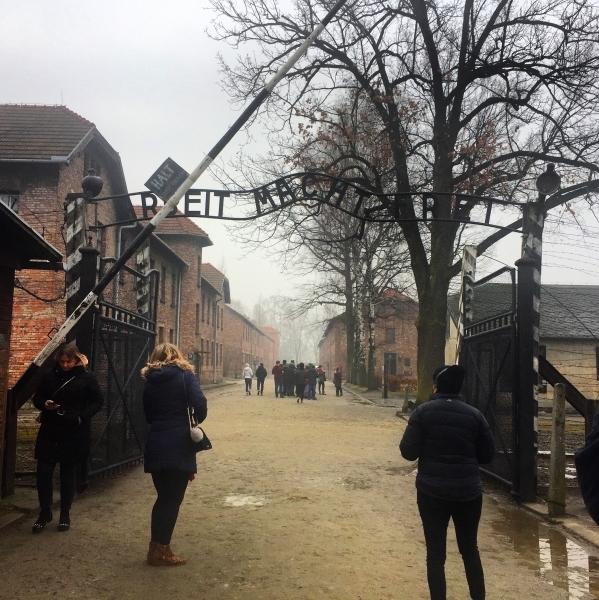 On arrival, we were given a tour of the first section of the camp, Auschwitz (the better known of the two sections). There, we were shown the infamous and chilling sign on the front gate (Arbeit Macht Frei - work makes you free). 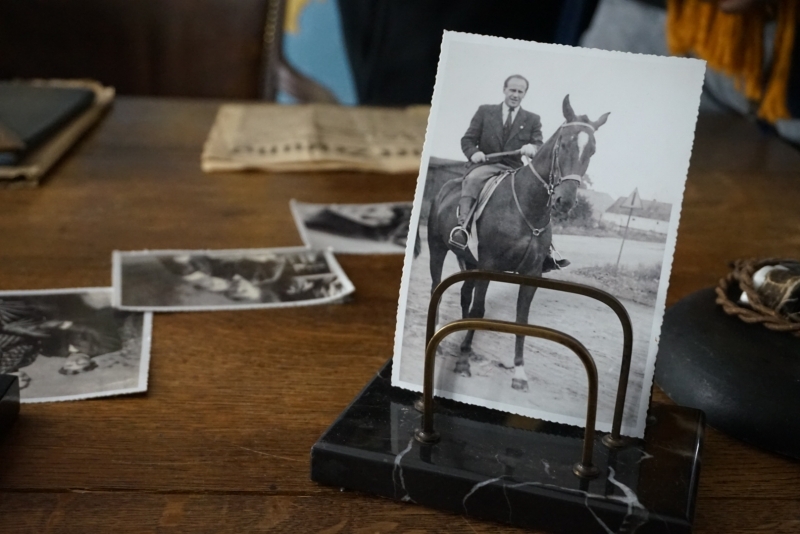 We were shown the appalling conditions the prisoners were subjected to in the block buildings and the thousands upon thousands of possessions that the Nazi's stole from the Jews and other prisoners. 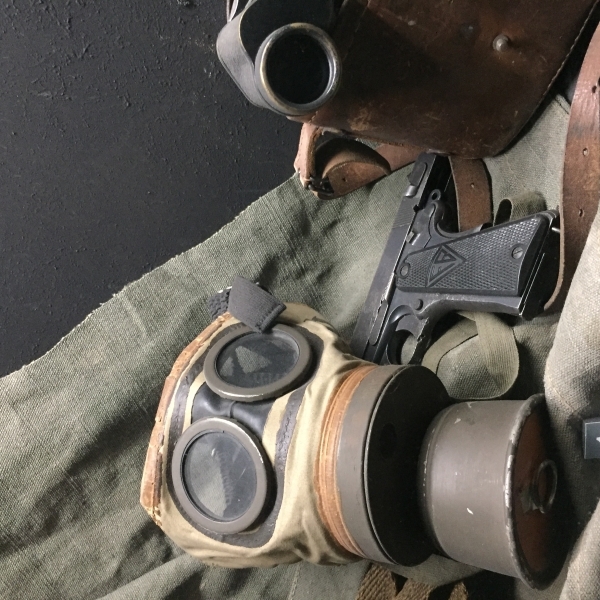 We were brought to the horrific gas chamber and the crematorium where hundreds of thousands of people were murdered, and the book of names, which lists the millions of names of people killed in the Nazi concentration camps. Later in the day, we visited the Birkenau section of the camp, which is about three miles from Auschwitz and is about twenty times the size. There we were shown the block buildings where the prisoners slept, the train tracks, which were used to transport the Jews to the camp, and the horrible ruins of the other three gas chambers and crematoriums. However, for me, the most shocking and traumatising moment of the whole experience was without doubt walking into the Birkenau camp, and seeing row upon row of block buildings, and realising that this was all that you could see on the horizon. Following this, we left the camp and returned to Krakow. Reflecting on the experience now, I cannot begin to describe the sense of eeriness, the unnatural feel to the area, and the general horrors within this disturbing place. 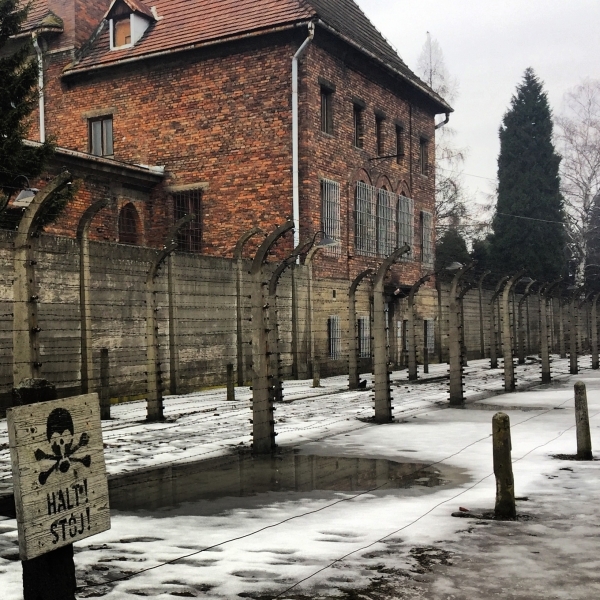 However, I feel that it was most definitely worth visiting, and I wholeheartedly believe that it should be kept open for the world to see, as a warning to humanity to never repeat these appalling atrocities again. On Monday, before we left for the airport at 8 in the evening, we went on a tour of Krakow's university district. 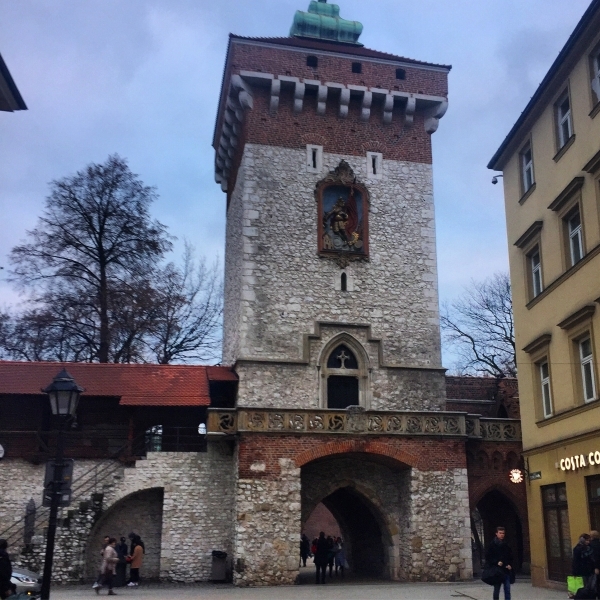 We saw the town square (the largest in medieval square Europe - where I found the nicest jam donut on the planet), as well as Krakow cathedral, which was a lovely way to spend our last morning in what is a beautiful city. On our final tour of the trip, we visited the Salt Mines in Krakow and had a fabulous tour of such an incredible feat of human work and engineering. 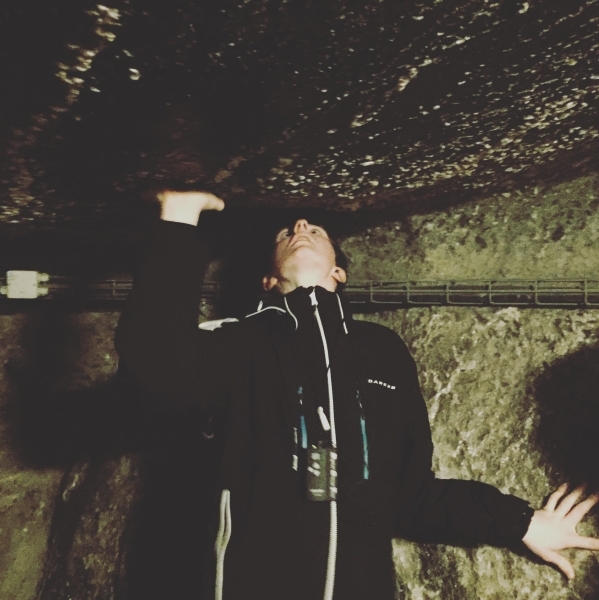 We descended to see the many chambers, statues of revered Polish men and women, and the massive underground cathedral, which was just breathtaking to behold, as well as learning the history of the mines, which was fascinating. It was great to visit such an impressive UNESCO World Heritage Site. Once the tour finished, we were sadly on our way to the airport, where we headed home after an eventful trip. Overall, I enjoyed the experience immensely, from an academic but also social side (my caterwauling rendition of Mr Brightside being one of my favourite moments along with the flippy cup game and the absolutely hilarious games of heads up). I feel I learned a huge amount from the trip. I personally would recommend this trip without a doubt to everyone, particularly those into history, because as the old saying goes 'if these walls could talk they would have some stories to tell.' 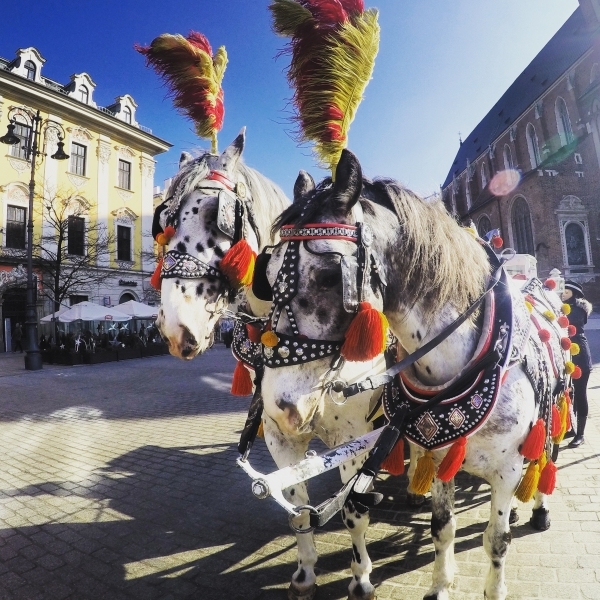 Krakow is in my opinion was the trip of a lifetime.